Coconut oil is a real food staple in many households and has many health benefits. 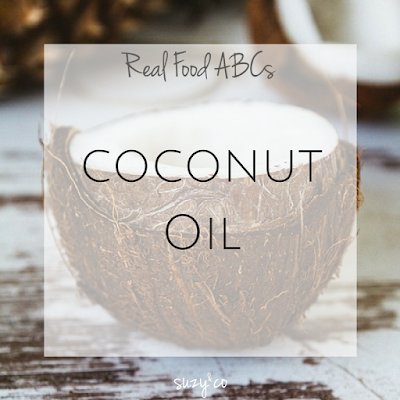 I had to include coconut oil in my abc's because I have been talking about it and converting people to using it for years. Although it is in vogue now, I am sure there are still some people who are hesitant to use it. It is loaded with saturated fat. LOADED. Don't fret about it. If you missed it, I linked a few articles in B for butter on the issue of saturated fat and heart disease. Also coconut oil is unique in its saturated fat chemical make-up. Most of the saturated fats are medium chain fatty acids. These types of fatty acids are readily absorbed by the body to provide energy. Which means they are less likely to be stored as fat. Coconut oil also contains lauric acid and caprylic acid which have anti-fungal and antiviral properties. The different ways you can use coconut oil are endless and many others have blogged about them as well. So I am just going to include what I use it for. Lotion - I will occasionally use coconut oil as a moisturizer. However, I do not use it on my face because it actually makes it more dry. Coconut oil is so versatile and such a healthy ingredient to have on hand. I definitely would recommend it for stocking up your real food pantry. Click here if you missed any letters.